U.S. Homeland Security Secretary Kirstjen Nielsen says she hasn't heard newly released audio of crying children who have been separated from their families at the U.S.-Mexico border. An audio recording that appears to capture the voices of small Spanish-speaking children crying out for their parents at a U.S. immigration facility took centre stage Monday in the growing uproar over the Trump administration's policy of separating immigrant children from their parents. "Papa! Papa!" one child is heard weeping in the audio file that was first reported by the non-profit ProPublica and later provided to The Associated Press. Human rights lawyer Jennifer Harbury said she received the tape from a whistleblower and told ProPublica it was recorded in the last week. She did not provide details about where exactly it was recorded. U.S. Homeland Security Secretary Kirstjen Nielsen said she hasn't heard the audio. She said the government has high standards for detention centres and the children are well cared for, stressing that Congress needs to plug loopholes in the law so families can stay together. Around 2,000 minors have been separated from their families in the past six weeks, since Attorney General Jeff Sessions announced a zero tolerance policy where everyone caught crossing the border illegally will be prosecuted. Children can't go to jail with their parents, so they are separated. The audio, in which children are heard pleading for their parents and other family members, was published Monday by a ProPublica article by Ginger Thompson. The article says the audio was recorded inside a U.S. Customs and Border Protection facility, by a person who asked not to be named out of concern about possible retaliation. The audio was given to civil rights attorney Jennifer Harbury, who then made it available to the independent, non-profit news team. In the recording, children are asked about where they are from and their family situation. One girl repeatedly asks to be put in touch with an aunt, reeling off a number she had memorized. Some weep as they ask for their mom or dad. 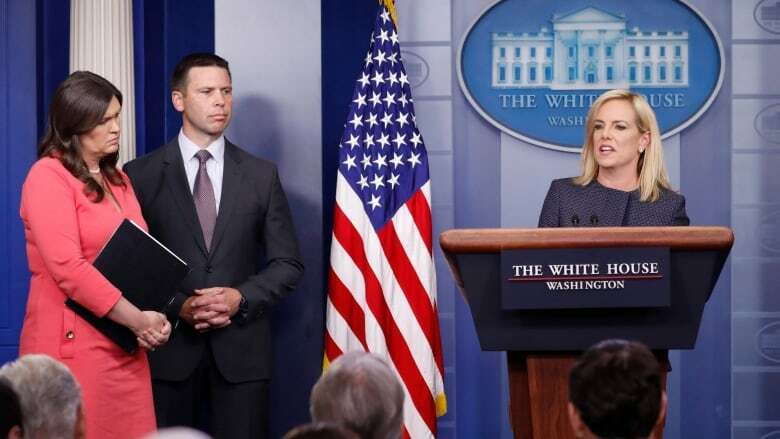 Nielsen, who faced questions from reporters about the Trump administration's actions on Monday, repeatedly defended the administration's actions and said the government has high standards for detention centres and the children are well cared for. While Democrats like Nancy Pelosi blasted such treatment as "barbaric" and some Republicans also voiced concerns, Nielsen and other Trump administration officials have said the separations are necessary to enforce immigration laws, and that it falls to Congress to change the laws. Both the House and the Senate are controlled by Republicans. Nielsen said Monday that agents are not acting cruelly, but are enforcing the laws passed by Congress. There is no law mandating the separation of children and parents at the border. Neilsen said past administrations asked immigration agents to look the other way when families crossed the border illegally, but no longer. The White House has said it would reject a narrow fix to address children separated from their parents at the U.S.-Mexico border, saying it wants Congress to "fix the whole thing." Press secretary Sarah Sanders said President Donald Trump's priorities, like funding a border wall and tightening immigration laws, must also be fulfilled. She says, "We want to fix the whole thing, we don't want to tinker with just part of it." Ted Cruz, a Republican senator from Texas, said Monday he would introduce a bill that would allow for faster hearings for people seeking asylum — and speedier deportation of those who don't qualify. The bill would also call for parents and children to be detained together as they await a decision, unless there's "aggravated criminal conduct or threat of harm to children." He's not the only one suggesting legislative changes. John Cornyn, another Republican senator from Texas, said he's going to introduce an updated version of a 2014 bill he backed alongside a Democratic representative. The bill would contain provisions to keep families together while they wait to go before the courts. "We have to keep family members together and prevent unnecessary hardship, stress and outrage," Cornyn said in a statement. "I would ask our colleagues on both sides of the aisle to take a hard look at this bill and to work together to find a reasonable solution for this component of the crisis at our border." Trump emphatically defended his administration's policy Monday, again falsely blaming Democrats. "The United States will not be a migrant camp and it will not be a refugee holding facility," he declared. "Not on my watch." See images of two of the centres holding migrants to the U.S.